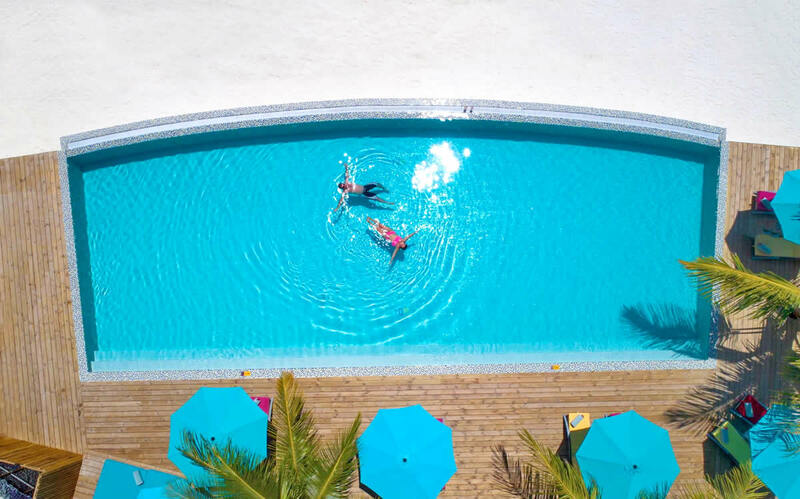 Embracing the greenery of Helengeli island with its beautiful house reef, this refreshing all-inclusive resort with laid-back island vibe and fashionable design opened its doors in November 2015 under the new name OBLU by Atmosphere at Helengeli! Just a short 50 minute speedboat ride from Malé airport, Helengeli is equipped with 116 villas and suites each with a mixture of rustic and tropical interiors. Accommodation is offered on the beach or over the water, and each room is equipped with a spacious open bathroom, and some with private pools. In addition to nice rooms and delicious food, Oblu at Helengeli is undoubtedly a paradise for divers. The resort has its own diving school, with certified PADI courses, and in the region there is an attractive selection of world class dive sites, including an incredibly famous house reef. In the North Malé Atoll, OBLU by Atmosphere at Helengeli is a vibrant and refreshingly modern all-inclusive resort with a stylish design and a relaxed island feel. With natural channels and a jaw-dropping house reef just metres from the island, this is a true underwater haven filled with spectacular coral and marine life that include silver-tipped sharks, lobsters and giant sea turtles. This trendy resort has a slightly younger vibe, with great watersports facilities and even Wi-Fi on your speedboat transfer, meaning you can flood your Instagram feed with pictures of paradise before you've even arrived at the resort. 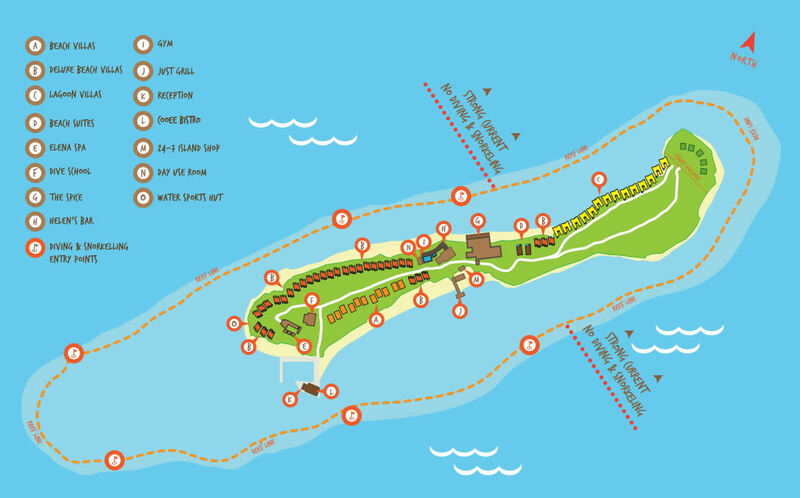 OBLU by Atmosphere at Helengeli is a contemporary all-inclusive resort located just a short 50 minute speedboat ride from Malé. 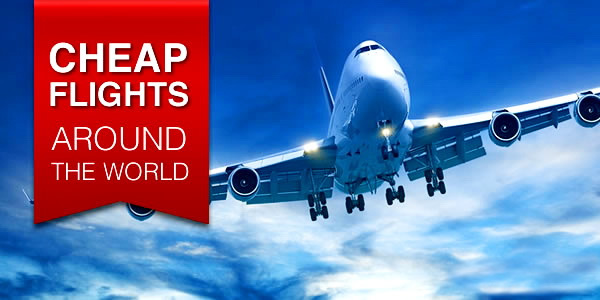 One aspect of its good value is the fact that it has a speedboat transfer rather than an expensive seaplane trip. The island is in the same atoll as the airport and Male but it feels remote and all alone in the northeast corner. Being set in the middle of one of the region's wide channels adds to this feeling and tells you why the resort has always been a big hit with serious divers. All of the villas and suites are contemporary in design, and feature classic Maldivian touches that add to their charm. Beach Villas are just steps from the ocean, with an outdoor terrace and generous open-air bathroom, while Lagoon Villas have the luxury of a private plunge pool, with an overwater deck that leads out into the surrounding lagoon. For the ultimate indulgence, the Beach Suites are a very exclusive retreat, situated on the sunset side of the island with spacious outdoor gardens and a generous private pool. On the same side of the island, mostly at the bottom end where the beach is, are the Deluxe Beach Villas. Like the Lagoon Villas, these are all semi-detached. On the other side of the island are the few Beach Villas. There isn’t much of a beach on this side but the lovely sand bar is just a very short walk away. The rooms look to be pleasant, modern and light-filled. They should be a calm retreat from the action in the water and around the pool, bar and restaurants. This public area is set right in the narrow middle of the island. This is usually the heart of a resort and particularly of all inclusives. 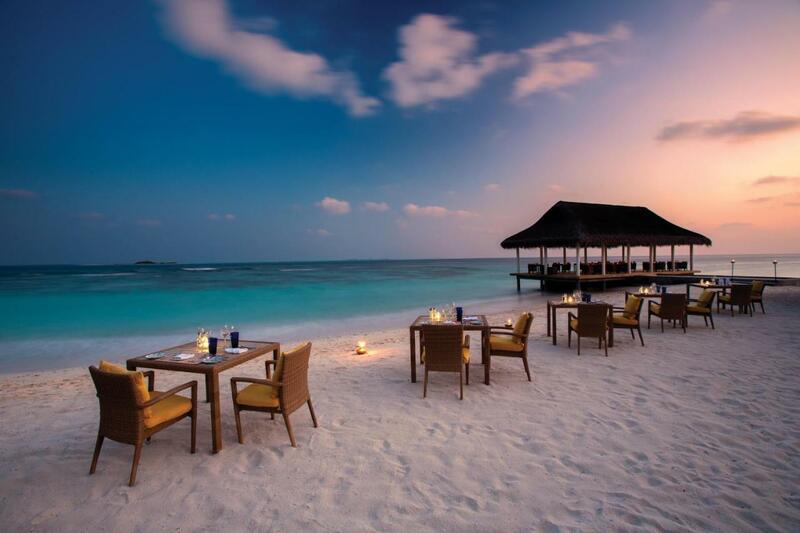 Maldives all inclusive holidaysare getting more and more popular so there are more such resorts being built. In the end the competition is all about value for money and OBlu looks like it could be a winner there. The island's rocky tip that faces to the open ocean is closed to guests and the currents in the channels on both sides work against long, wide beaches. However, one side of the island (south-west) is much better than the other (and of course there is a view of the sunset). A permanent sand spit at the southern tip is located two steps from the shore. Sandy beaches are not subject to erosion, and look just perfect. In addition there are several breakwaters and walls with proper care for the environment, but nevertheless the surroundings are always pleasing to the eye. 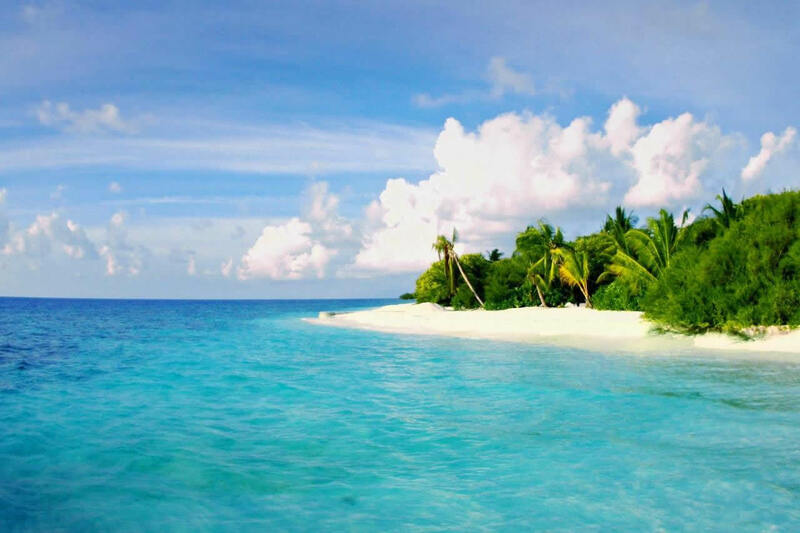 On the theme of diving, it is hardly necessary to talk about TGI Maldives, since the clientele is fully informed about the options from the past experience, as well as from the reviews on the site. This is a resort, where divers know their business. Training is readily allowed, but most divers are experienced and very experienced. The underwater world in the northeast corner of North Male Atoll does offer an abundance of marine life with a large number of dive sites. As they say, there is no dive 'in the bubble'. Fish life in the region is extremely abundant and diverse, from many schools of small reef fish to the top predators: sharks, barracuda and tuna, and in the season of mantas rays and whale sharks. 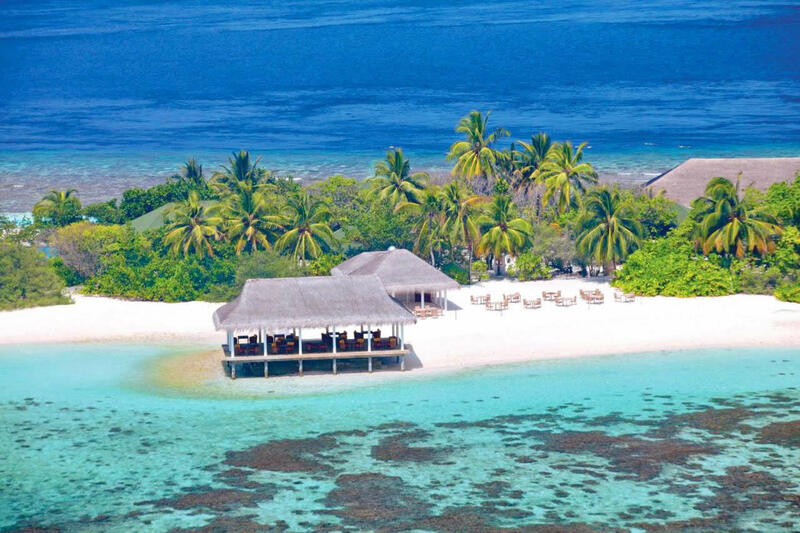 One of the finest thilas anywhere, Helengeli Thila, is just 6 minutes from the island. Compared to the island, the lagoon is quite small - hence the exotic Helengeli's house reef that is only a few meters from the beach. The house reef itself is good for snorkeling and diving and has 6 entry points and supply tanks from the dive center, being this very popular site. Black-tip reef sharks, rays, sea bass and octopus are just a few catching moments for your eyes during the day, and at night the cave of lobsters comes to life. Although the house reef is close to shore all around the island, the channel currents and the open ocean at one end mean the area for relaxing snorkeling is really just down and beyond one half of one side, where the beach and trailing sand bar is. The fish life is very good but the coral growth is a little disappointing, and besides renting masks and snorkel is free of charge. Daily snorkeling excursions from the resort include a full day Manta rays snorkelling at Boduhithi Thila, and a snorkeling + barbecue trip to the famous uninhabited Kagi island on the northernmost tip of the atoll. These unique characteristics make diving here an unforgettable experience! Each side of the island is absolutely ideal for diving in the canal. The current in the atoll allows you to observe all marine biodiversity, including pelagic fish categories, such as tuna, sharks, rays and jackfish. Dive sites in this area are available, both for beginners and advanced divers ... from diving in the reef, to drift diving and exploration of underwater towers! For dining, The Spice is the resort's main buffet restaurant where you can enjoy delicious international dishes, all freshly prepared at live cooking stations. Open for lunch and dinner, the beachsideJust Grill is the resort's speciality à la carte restaurant, where you can tuck into succulent seafood and mouth-watering grilled meats in front of stunning Indian Ocean views. Helen's Bar is the perfect place for a relaxing after-dinner tipple, with a fantastic selection of wines, beers and spirits to choose from, and a recommended menu of exotic cocktails to try. The best all inclusives are lively, friendly and fun places that keep going long into the evening. Both the guests and the staff are more relaxed where there is no issue of tracking expenditures or signing for everything. Whether OBlu becomes one of the best Maldives all inclusives we’ll have to see but Atmosphere do have some experience in this popular and growing segment of the market. Atmosphere at Kanifushi is gaining a good reputation as a premium all inclusive. Most of the guests are now Europeans. If parties and beaches are not your forte - this place is an unbeatable value for money. The new, improved Oblu Helengeli is just a perfect pearl. Nevertheless, a resort with such a large number of divers will never be short of night parties, including dancing. In fact, this is an ultra quiet island in the evenings there is no organized entertainment (except diving nights), but this does not mean that after sunset everyone goes to sleep and there is absolutely nothing to do. With guests during the day go for diving or on excursions, and the picturesque island is ideal to swim, snorkel, relax or just do nothing. In a pleasant setting the modern ELENA Spa with luxury spa products helps the whole process. Helengeli has long been one of the traditional islands for diving in the Maldives. After a series of renovations, this hotel is now much larger than before. The resort caters to many tastes, offering to enjoy the authentic barefoot experience and tropical vibe, but however today requires some style and modernity. With a great value, all-inclusive offering, a beautiful and clearly well managed, Helengeli is an ideal for those looking for a true island paradise, including single and families with children alike. Stylish and contemporary beach suites and villas; its very clean. For some Deluxe Beach Villas (on west side island, between n°218 and 226) that have direct access to the beach, you will only find rocks and dead reefs beyond the front step villa. But this is due to erosion and tide on this side of the island. Depending on the weather condition, the 50min boat trip between airport and island could give you seasickness if you are not used to it. Difficult to get more than 2 dives in one day due to dive centre opening times.